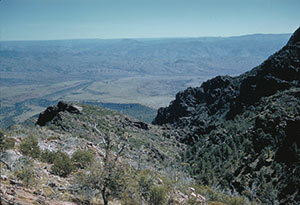 The United States Congress designated the Mazatzal Wilderness (map) in 1964 and it now has a total of 250,761 acres. All of this wilderness is located in Arizona and is managed by the Forest Service. In the language of the Aztecs mazatzal means "an area inhabited by deer," but just how the word reached Arizona, or what significance it holds, remains somewhat of a mystery. Yes, deer inhabit the area. Yes, evidence shows that humans, among them the Yavapai and Tonto Apache, have exerted their influence here for at least 5,000 years. But there is no indication that the Aztecs themselves ever journeyed to this rough mountainous region. Established as a Primitive Area in 1938, Mazatzal became pre-Wilderness Act "wilderness" in 1940 and one of the original Wilderness Areas in 1964. Narrow, vertical, difficult-to-access canyons fill the central and eastern portions, while the Verde River rolls through the western portion. The rolling riparian terrain along both sides of the Verde constitutes Arizona's only Wild River Area. Given how close Mazatzal is to Mesa, a major population center, this is a remarkably remote and beautiful area. Elevations range from 2,100 feet at Sheep Bridge in the southwest to 7,903 feet on Mazatzal Peak. Sonoran Desert shrubland in the west rises to semidesert grasslands, then mountain shrubs such as manzanita and turbinella oak. The higher elevations support scattered pinion-juniper woodlands and a few ponderosa pines and Douglas fir. With about 240 miles of excellent to poor trails and other hikeable tracks, backpackers should find plenty of routes to trek. The Verde River Trail follows the river for about 28 miles and invites horsepackers. The Mazatzal Divide Trail, the prime north-south route, runs about 29 miles and stays in excellent condition. The scenic Barnhardt Trail, 6.2 miles long, attracts many hikers but is not recommended for horses. Off the trails, you may find hiking impossible. Summer temperatures often reach 110 degrees Fahrenheit, and there is precious little shade to provide relief. Lightning storms are common in July and August. Group size is limited to 15 people and 15 head of livestock. Length of stay is limited to 14 days. Planning to Visit the Mazatzal Wilderness? How to follow the seven standard Leave No Trace principles differs in different parts of the country (desert vs. Rocky Mountains). Click on any of the principles listed below to learn more about how they apply in the Mazatzal Wilderness.